If you've never heard of the [deep breath] Microsoft Digital Advertising Solutions Creative Awards it may most likely be because — if you reside in the U.S. like yours truly — it's a European competition, or because it's only two years-old, or, possibly, because its six-word-long name is downright forgettable, if not obnoxious — or maybe, by default, you just stop reading anything after the word "Microsoft". Also, the criteria for entering is somewhat limiting: Advertising that appeared only in a Microsoft-run web site like MSN or XBOX Live. The one uptick to these awards is that the first-prize winners in each category get automatically entered into the Cannes Cyber Lions competition — a big deal if there ever was one. Seeing that a coveted "Lion" award was the ultimate bait, Brand Guardians and johnson banks (who are the firm responsible for the playful identity), focused on fauna-influenced naming and arrived at "Mouse" as a better, catchier and more memorable name for these awards. I haven't expressed sheer effusiveness about a logo on Brand New before, but I think this warrants it: I love it. I would even call it "brilliantly executed" and stand behind it 100%. I suspect many will disagree but that's the least of my worries. 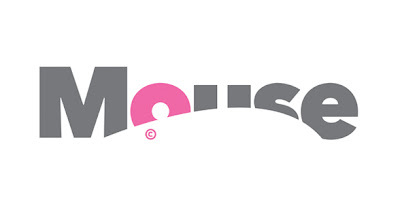 The biggest compliment I can pay this logo is that it makes me smile as the details are revealed: You read the word mouse… you see the white mouse… you see the big, pink ear… and finally you see the copyright symbol, the punch line to this sophisticated design joke. I can go on and on about this logo: From the colors, to the type selection (Avenir Next), to the overall composition: It all works. It's embarrassing to compare this to the old non-logo, with its faux-brush stroke arrow, so I won't even go there. And, to boot, the identity program is equally clever and playful while emphasizing that winning a Mouse could earn you a Lion.